Read the review of LEO Privacy Guard - an app that offers a lot of tools that can help you protect all and any of your data on your smartphone that you consider private. Know how it works, what all it offers and what all is good and bad in it. LEO Privacy Guard is a smartphone app that is designed to secure your private information on your phone from prying eyes. Be it a curious child at home who might send a joke email to your boss, or a peeping tom roommate or no matter who, you can prevent any unauthorized access of your apps by LEO Privacy Guard. You can secure access to any of your app like Whatsapp, Gmail. Facebook, Google Drive, Gallery or any other non-personal app and that too without changing the look of your smartphone lock screen or app thumbnail. Only when one tries to access the app does a PIN or pattern challenge comes up. There are 2 different modes present by default with the app - Guest and Home - and if you want you can create more such modes to change privacy settings according to what type of place you are at. Keeping in mind that locking apps on your phone can make you appear a little weird or suspicious, there are a few trick locks too which don't look like app locks but protect your privacy all the same. First of all you will need to download the LEO Privacy Guard app from PlayStore. When you launch the app the first thing that it shows you what all it does. You will be asked to set a pattern lock which you will need to remember because this is what will be used to unlock the apps you lock with this app. You also need to set a secret question which will come useful in case you forget the pattern or PIN. After that LEO Privacy Guard will scan you apps, photos and videos to see how much of your personal content is at risk and accordingly assigns you a Privacy Score which is based on a scoring algorithm written by LEO Privacy Guard. Once it has decided the score it will suggest you ways to improve your privacy score. This can be done by locking more apps, hiding photos and videos and setting up the anti-theft functionality once the Privacy Score has been assigned. As you can see I have quite a low score on Privacy. This is normal because none of my apps was yet locked neither any of my images or videos hidden. After locking few of my "personal" apps especially my messaging apps, my score improved a little but still stayed in the red region. However, if you like me don't have much other things you want to hide then you can chose to ignore the low score. Before we proceed do note that if you are tasking some app to protect your privacy, you give that particular app an unlimited access to your private data. Use of LEO Privacy Guard requires you to give access to Call logs, SMS and contact permissions, Camera Permission, GPS Location permission and some other permissions depending on the smartphone you are using. So this is a decision that you have to take whether you are ready to go ahead with trusting an app to protect the privacy of all of your other data. App Lock : App Lock is the main function of this app. It protects your app from any type of unauthorized access. It puts a PIN or pattern lock on the app which you have to solve before being able to access the app. As you saw above, LEO Privacy Guard populated a suggested list of apps I should lock based on the usage. Here instead of just having a PIN or pattern, you can go for something more fun through the App Covers. 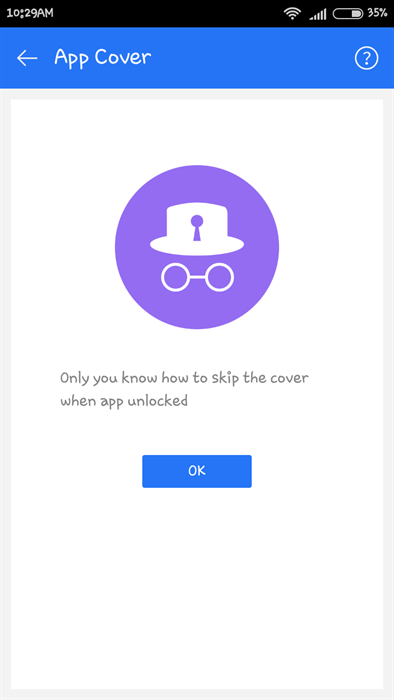 App covers are special screens which come when someone tries to access an app. They ask the user to do some obvious action which would always fail and it is only the owner who would actually know the way to remove that cover. For instance, if you select "Error" as App Cover, whenever someone tries to open that app they will get an error message that the app has crashed. However, that is not actually an error message and you only will know how to actually remove that cover page and access the app beneath which by the way is by sliding the error message rectangle to the right. Contextual modes : These are predefined settings which you can set as per your privacy requirements at different places. By default there are 2 modes- Guest and Home but if you want you can create more. For example, while at office I want my email app to be unlocked but Whatsapp to be locked and the opposite at home. For this I can modify the Home mode and create a new Office mode accordingly. And so that you don't have to each time do the effort of setting the mode when reaching a different place, there are a few methods to automate this mode change. For example you can use the Time lock when you want to set which mode to work when, like you set LEO Privacy Guard to work in Office mode from 8 am to 5am. Or, you can the Position lock which will detect the Wifi you can connected to and accordingly set the mode. 6. Open Lock & Trace & Alert & Format: #onekey. Hide Images or Videos in Vault : Hiding images or videos I think is one of the most common requirement for most of us. Now, instead of locking the whole gallery, you can hide those certain images or videos and rest assured. To do this go to the Main Interface of LEO Privacy Guard and navigate to Hide Images/ Hide Videos section and select the images or videos you want to hide. To unhide these you need to deselect the same from the same location. Take care that you don't hide any image or video and uninstall the app. In this case your hidden images/videos don't become visible by default and you will have to reinstall the app to make those media files visible. You can also use this vault to hide SMS, call logs and contacts. We all are not in a habit to stay connected at all times. Sometimes we don't have data plans active on your phone and free Wifi points or hotspots are a blessing in such cases whether we are in a cafe or at airport. However, some places like cafes have unprotected Wifi access where your data might not be getting encrypted and whatever you will access can be tracked by someone else. LEO Privacy Guard scans security specifications of the Wifi network you are planning to connect your phone to. 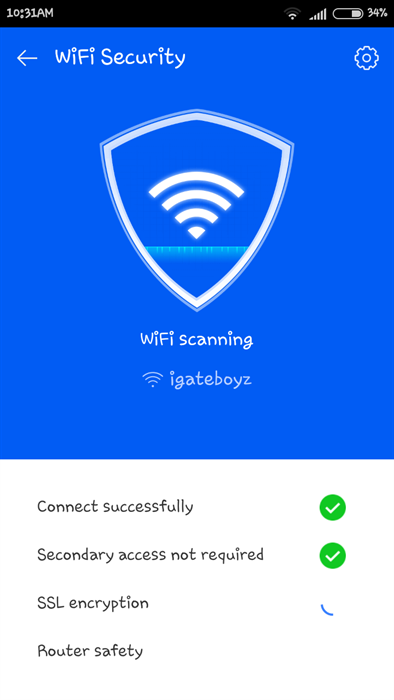 It will make sure that the Wifi is using secure form of transmission so that your data is safely transmitted and your privacy not compromised. Speed Boost : Not exactly a feature you want out of a Privacy related app but since it is present we decided to give it a run. The closes the background applications that are occupying the RAM and free it up to make sure that your other applications run smoothly. LEO Privacy Guard is an amazing tool to safeguard your privacy from any person who might negatively affect you by accessing the data on your smartphone. It might be using advertisements to earn some money for its developers, but the ads are not at all inconvenient neither are are they too frequent. With the tools it offers to protect your privacy, the attention to details that has been given. seeing a few ads now and then can be ignored. Using this app is not about hiding something but rather is about safeguarding accidents that can happen if you have kids at home that might send mails to your colleges or boss or preventing your partner from accessing your messages just when you are planning a surprise birthday party. Though this is a small reason to use it, I am sure you can have many more bigger reasons to use it. I highly recommend this app to all our readers and considering that it is completely free I see no reason why you shouldn't use it! App Covers lightens up the privacy safeguards you have taken on your smartphone for anyone else using your phone. Allows you to lock each and every piece of data that you can consider private including images, videos and all types of messaging apps. A lot of tools means that some FAQs have to be referred from the website to be able to utilize all its features. Example I want to set up WhatsApp, Viber and messenger but I'm unable to setup because I don't know the URL for the above Apps nor I'm a software developer.